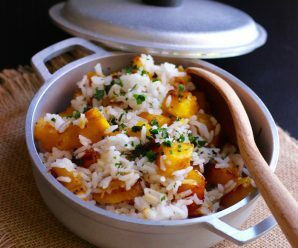 Plain white rice is eaten by most people in Colombia every day, but for entertaining, a more interesting rice dish is often served, such as this one. This Red pepper and Tomato Rice dish is the perfect accompaniment to your favorite grilled meat or poultry. Heat the olive oil in a pot. Add the onions, garlic and red bell pepper and cook until onions are translucent, stirring occasionally, about 5 to 7 minutes. 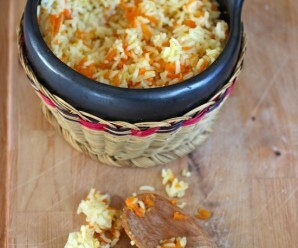 Add the rice, stir with a wooden spoon to coat well, and cook for 1 minute. Add the water, vegetable bouillon, tomato puree and salt. Bring to a boil, stir and decrease the heat to low. 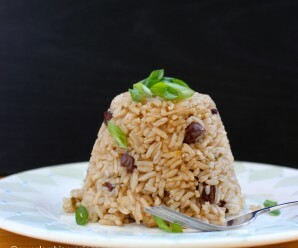 Cover and cook for about 20 minutes or until the water is absorbed and the rice is tender. Remove from the heat and let rest for 5 minutes. 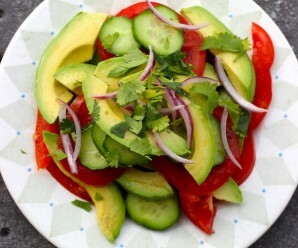 Looks good, tasty, and fast – my kind of meal! I think this recipe can make a great side dish to any kind of meat! That is a great side dish! Delicious! I am finally growing them in my garden. This is my first time to your blog. You have a wonderful blog with great recipes. 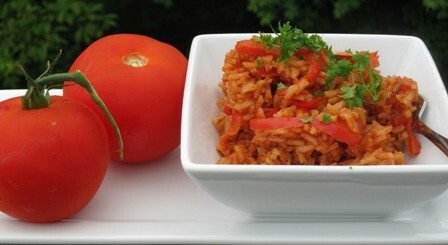 The Tomato and Red pepper rice looks very delicious and inviting. Presentation is awesome. Hi! This is my first time in your blog and I love it! It’s very international and this recipe… sounds so simple, but delicious! Hope to hear from you, Liz.